A supermassive black hole has been feasting on a wandering star for a decade – the largest such meal for a black hole ever seen, scientists say. The black hole, situated in a small galaxy 1.8 billion light years away, has set the record for celestial meals in length and size. The discovery was made by three orbiting X-ray telescopes, including NASA’s Chandra X-ray observatory. Details of the study have been published in Nature Astronomy. “We have witnessed a star’s spectacular and prolonged demise,” Dacheng Lin, lead author of the study, told Phys.org. 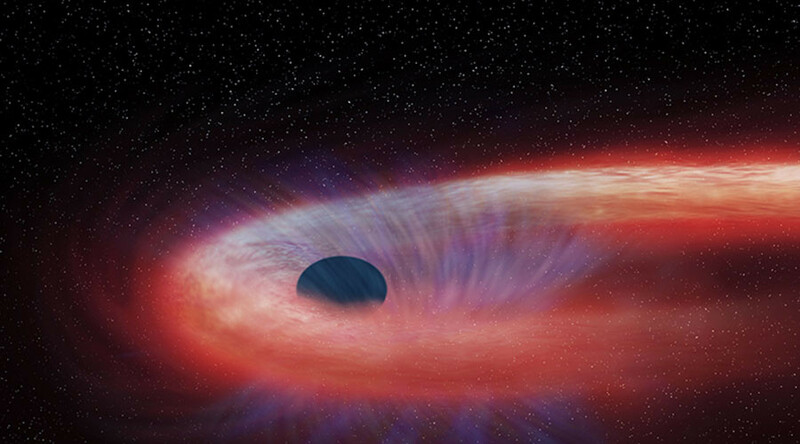 The star became the black hole’s breakfast, lunch and dinner when it wandered too close to the region and was torn away by gravity in an event known as tidal disruption. This causes some of the stellar debris to be hurtled outward at high speeds while the remainder becomes hotter as it falls into the black hole, generating a distinct X-ray flare. This particular tidal disruption involved either the largest star to be completely ripped apart and devoured by a black hole or the first instance where a smaller star was completely ripped apart, according to NASA. Observations from the X-ray data indicated that in this instance the black hole was gnawing on the remains of the star for a decade. Scientists say that this unique event could help explain how supermassive black holes were able to reach masses about a billion times higher than the sun when the universe was only about a billion years old.